Mike Larson writes: By now, you've probably heard of what I'm calling the "Paulson Plan" — a federal government proposal to ease the pain of the housing and mortgage market collapse. 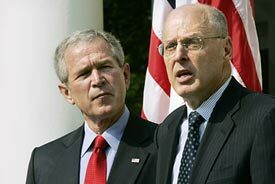 President Bush and Treasury Secretary Henry Paulson held press conferences to highlight the key points yesterday. I'll be discussing it on CNN's "Open House" show this weekend [Editor's note: 9:30 A.M. Saturday on CNN and 3:30 P.M. EST Saturday and Sunday on CNN Headline News]. But first, I wanted to share my thoughts with you. Roughly 100,000 subprime adjustable rate mortgages (ARMs) are on track to "reset" EVERY MONTH for the next two years, according to UBS. A reset is when the interest rate and payment on an ARM adjusts higher. The FDIC projects that total resets will amount to roughly $330 billion through next December. Interest rates on many ARMs are expected to rise from a range of 7% to 9% to 11% to 13%. Thanks to these resets ... falling home values ... and the lagged effect of reckless lending (falsifying incomes, writing loans at excessively high debt-to-income ratios, etc. 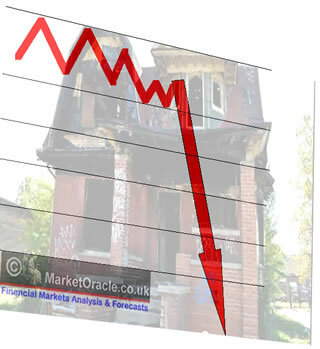 ), we're facing a foreclosure tsunami. The Center for Responsible Lending projects that souring subprime mortgages alone will result in 2.2 million foreclosures over the next few years . The Mortgage Bankers Association just released awful data on third-quarter mortgage delinquencies and foreclosures. Some 5.59% of mortgage borrowers were behind on payments in the three months ended this September. That's up from 4.67% a year earlier and the worst reading going all the way back to 1986 . A record 0.78% of U.S. mortgages entered foreclosure in the quarter. And the overall foreclosure rate jumped to 1.69% from 1.05% a year earlier. That's the highest the MBA has ever found since it started collecting data in 1972. Worse than the 1991 economic downturn. Worse than the dismal early-1980s recession. And worse than when 30-year mortgages were going for 18%! All told, the mortgage and housing crisis could cost investors and banks as much as $400 billion because of writedowns and losses on mortgage-related securities and other investments. In fact, a New York Times story in late October pegged the total loss in household wealth due to falling home values at anywhere from $2 trillion to $4 trillion! So now, the Treasury Department is jumping into the fray with a plan designed to cushion the blow of ARM resets on overstretched borrowers. Category #1. Those who can afford their mortgages now, and who can afford them post-reset. These people won't be helped because they don't "need" it. Category #2. Those who can't even afford their loans at the current teaser rates. These people can't be helped because their mortgages and homes are just plain unaffordable. In simple terms, they're hosed and many of them will lose their homes. Category #3. Those who can probably refinance if they want to (i.e. they have enough equity and their credit is good enough for them to qualify for a loan despite today's tighter lending standards). Paulson would prefer that these people be refinanced into new mortgages, rather than have their existing loans modified. Category #4. Those who can handle their mortgages at the current teaser rates, but who couldn't afford them if their rates and payments were to reset higher. It's the people in category four that are being targeted for relief, provided they have steady incomes and "relatively clean" payment histories. Specifically, borrowers who are at least 30 days behind on their loans at the time of the potential modification — or who have been more than 60 days late within the past year — will be excluded. The program will apply to anyone who took out a subprime ARM between January 1, 2005 and July 31, 2007 — and whose rates reset between January 1, 2008 and July 31, 2010. The idea is that these folks will have their low teaser rates "frozen" for five years. That will theoretically allow these borrowers to stay in their homes, improve their credit, and eventually refinance. It's also designed to prevent even more foreclosures, which could exacerbate the home inventory glut and push home prices even lower. Another part of Paulson's plan: Allow state and local governments to sell tax-exempt bonds to raise money to refinance borrowers out of subprime loans. Currently, such bonds can only be used to finance things like first-time home buyer purchase loans. The $400-Billion Question: Will the Plan Work? My belief is that it will help some borrowers at the margin. But it's far from a panacea ... there are several major hurdles to success ... and the risk of unintended consequences is high. In other words, like the FHA reform proposals I wrote about back in September , this program will make life easier for some borrowers, but won't "fix" the overall market. Problem #1: It's going to be extremely difficult to get everyone on the same page. This isn't your father's mortgage market. Banks generally don't make 30-year loans to borrowers and hold them on the books forever. They originate those loans, and then unload them into the secondary market. There, those mortgages are bunched together into all types of securities, which in turn are bought by income-seeking investors the world over. To see what I mean, check out this mortgage flow chart that was included in Congressional testimony delivered back in April by FDIC Chairman Sheila Bair. The net impact of all this is that the interests of loan investors, loan servicers (the guys who collect our mortgage payments), and mortgage borrowers aren't always aligned. Holders of certain chunks, or tranches, of mortgage bonds may lose some money from modifications; holders of others tranches may benefit. No wonder BNP Paribas calls the plan a "recipe for serious litigation." Problem #2: Modifications aren't a permanent fix because modified loans frequently go bad anyway. You may have seen the term "recidivism rate" before. It's the rate at which criminals, after being tried, convicted, and incarcerated, turn around and commit new crimes. Rates are pretty high — a 1994 study here in the U.S. found that almost 68% of prisoners released that year were re-arrested within three years. Turns out the record isn't so good for homeowners whose mortgages are modified, either! Joshua Rosner at Graham-Fisher & Co. says a full 40% to 60% of subprime and Alt-A borrowers who have their loans modified end up defaulting anyway within the next two years. At best, this proposed bailout plan could lead to a bunch of lenders kicking the can down the road. Losses won't be eliminated; they'll just be pushed out into the future. And if home prices keep falling — as I expect them to — losses on those defaulted loans will just get worse! So put yourself in the shoes of a banker. You can foreclose and sell now, and get maybe 75 cents of every dollar you lent back. Or you can roll the dice on your borrower — who has at least a 4 in 10 chance of defaulting anyway. If he does, and values keep falling in the meantime, you might get just 60 cents on the dollar in a year or two. Neither option is very good! And what about borrowers? If they stick around in a falling-price environment, even at a lower interest rate, they'll end up making monthly payments for several months against properties that are losing value. Then when they go to sell one or two or three years down the road, they'll find themselves upside down to an even greater degree. In other words, modifying loans on a wholesale basis may not be the best deal for lenders or borrowers. Problem #3: Resets aren't the only cause of foreclosure — or even the biggest one . Here's a shocking statistic: Borrowers are already behind on roughly 25% of subprime loans made in 2006 that don't reset until 2008. Reason: Because home prices are falling. As a recent Federal Reserve Bank of Boston paper points out, declining home prices play a "dominant role in generating foreclosures." Think of it this way: When borrowers owe more than their homes are worth, they have a psychological incentive to give up. The question becomes: "Why should I keep paying my mortgage on this brick-and-mortar albatross?" And the answer, all too often, goes something like this: "It's never going to be worth what I paid, so I'm walking!" Then there's the financial incentive. The median price of an existing home in this country was $207,800 in October, down $22,400 from its July 2006 peak. Twenty-two thousand bucks is a lot of money — a little less than half what the median household earned last year ($48,451). It's also almost SIX TIMES what the typical American family has in the bank ($3,800 as of the Fed's last consumer finance study)! Housing is being hit by a perfect storm. The latest bailout plan will help, but it's not the perfect solution. Moreover, price declines in many parts of the country are even bigger. One new townhome development a few miles down the road from me closed on its first units about 18 months ago for the mid $500Ks. The developer is selling the last few for the low-to-mid $300Ks. Look, walking away and mailing your keys back to your lender is a pain. You have to uproot your family and find a place to rent — and your credit gets trashed. But given the magnitude of the price declines we've seen, and the likelihood that prices will decline another 5% to 10%, more borrowers are going to make that choice — even if they're offered temporary interest rate relief. A possible silver lining: There is at least one relief effort that is partially targeted at the "upside down on your loan" problem. It's proposed legislation in Congress that would empower bankruptcy judges to rework loan terms. Right now, judges can restructure other debts (farm loans, commercial real estate debts, credit cards, etc.) in bankruptcy, but not primary home mortgages. If this new legislation passes, judges could extend a borrower's loan term, cut his loan rate, and/or "cram down" the loan principal to the amount of the home's "fair market value." The rest of the debt could be wiped away. The biggest problem with these programs is that they punish responsible borrowers to some degree or another, while bailing out those who were reckless or careless — lenders, borrowers, investors, you name it. First, if you're a homeowner having trouble making your mortgage payments, don't hide under a rock. Get in touch with your lender to discuss workout options. You can also call 1-888-995-HOPE to gain access to mortgage counseling, if necessary. Third, with the government throwing more and more money at the problem and the Federal Reserve primed to slash interest rates again, there are going to be survivors, too. You CAN start looking for a bargain or two — like prudent banks that have been unfairly tarred by the housing and mortgage meltdown. Fourth, most importantly, you should continue to focus on investing in markets and sectors that have nothing to do with mortgages and housing — foreign stocks, consumer goods makers, and the like.